Of Sauble Beach passed away gently in her 99th year May 14, 2013. Loving wife and best friend to the late James Kenneth "Ken" Halls (2003). She is survived by her children, Ken and Susan; and also 7 step-grandchildren and 13 step-great-grandchildren. 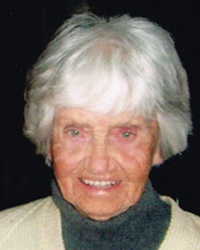 Dorothy lived a full and healthy life, living at Sauble during the summer and Arizona during the winter. A public memorial service will be held in the chapel of the THOMAS C. WHITCROFT FUNERAL HOME & CHAPEL, 814 Bruce Rd. 8, Sauble Beach (519)422-0041, on Saturday, August 10, 2013 at 1:00 p.m. Following the service, friends are invited to remain and enjoy a reception with the family.